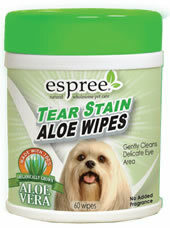 Our gentle, pH balanced, easy to use eye wipes contain Aloe and Chamomile. Mild cleansers remove odor and drainage, restoring fresh softness to the fur. May be used as a facial wipe to clean the face and mouth areas. Alcohol free. May be used as needed for a fresh clean pet. 60 wipes. Directions: Safe for daily use. Do not get directly in eyes. Do not flush, Keep container tightly closed, Store in a cool dry location.